The AST Polygeyser Bead filter is AST’s patented line of beadfilters featuring a breakthrough in filter technology: automatic pneumatic backwash for hands-off maintenance and low water loss. 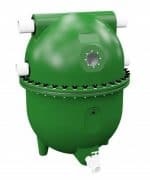 Learn more about our unique PolyGeyser filters below, or contact the AST team and we will help you choose the perfect PolyGeyser for your application. The PolyGeyser filter is a breakthrough in filter technology. It is very different from most filters on the market due to its auto-pneumatic backwash mechanism. Water enters below the bed of enhanced nitrification media and travels upward through the filtration chamber where mechanical and biological filtration take place. 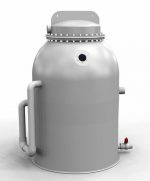 Simultaneously, air is introduced into the charge chamber at a constant predetermined rate to achieve the desired backwash frequency. Once the charge chamber has reached capacity, the pneumatic trigger fires, releasing the entrained air from the charge chamber below the bead bed. The sudden release of air from the charge chamber causes the beads to mix as the air agitates the beads. As the beads drop, the bead bed expands downward while simultaneously water rushes downward through the expanded beads, sweeping the solids away and into the air charge chamber. In the chamber, the solids settle out from the backwash waters and are later removed from the filter. 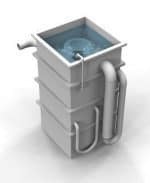 Essentially, this type of filter recycles the backwash water while concentrating the waste products so that you have extremely low water loss while maximizing the nitrification capacity. Frequent backwashing has proven advantageous for optimizing the nitrification capacity of a PolyGeyser filters. Numerous gentle scrubbing cycles promotes a higher rate of nitrification by maintaining a healthy thin biofilm on the surface of the bead media. Typical backwash cycles occur every 3-6 hours.